I’ve always wanted to have the chance to design my own studio room. Getting proper low noise acoustics can be tough. Well, I finally had my chance and it was a fun process to go through. The room was an 11’W x 17’L room. The prerequisite was a room that can be used for shooting corporate video against a green screen, with minimal outside noise being let in. I decided to mockup a design using Google Sketch up. The free version was enough for me to do a rough room layout. The great thing about Sketch up is that you can download other people’s models. 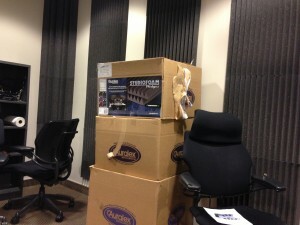 Luckily I found the Auralex foam pieces I needed right there in 3D Models for Sketchup. My design was well balanced between the live wall and the foam. We wanted a dead sound, but wanted the room to still have some life to it. After submitting my design, I ordered the foam, velcro sticky tape, and the Green Screen Banner and Stand. I was happy to finally be able to design a project studio and bring it to life. 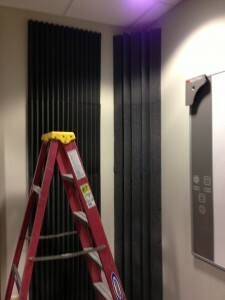 Once the foam arrived, I decided to start by attaching the 2′ x 2′ panels. I attached them one at a time using Velcro Sticky tape. The Velcro Sticky tape was an excellent way to go. I attached the foam by adhering a few pieces on each corner of the squares. The result was a vertical striped design. Next, I attached the bass traps using Velcro as well on each outside corner. I placed an extra piece in the middle outside wall for extra weight support too. 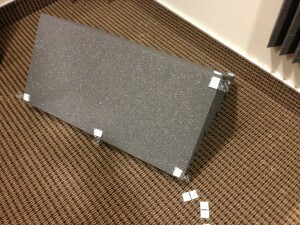 The bass traps felt bulkier so I wanted to make sure they were securely attached. It’s also worth noting that if the surface is dusty that it should be wiped first and allowed to dry. Obviously velcro might not work in all instances. If your walls are rough you may have to buy boards and attach the foam to the boards. Then attach the boards to the wall. In this case, I had to attach the panels to drywall, so it was an easy choice. Once I attached all the bass traps to the wall, I really starting feeling good about the design. 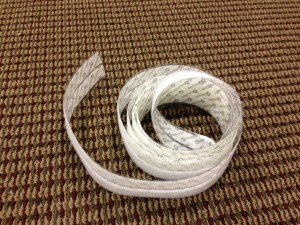 The bass traps were easily supported by 5 pieces of Velcro and I made sure the panel patterns matched for aesthetics. I applied the bass traps on every wall’s corner. The most important thing in this project is to capture the middle lows to reduce boominess and the high end room noise for clearer sound. I wouldn’t expect total isolation with this design, nor would I expect to be able to block out all outside noise. Next, I setup the banner stand and hung the green screen curtain. 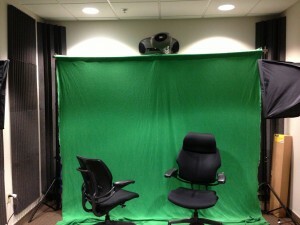 This gave the room a finalized look and will allow background effects when shooting video. For those who don’t know how a green screen works, it works a lot like Adobe Photoshops magic wand tool. The color range gets selected and then whatever color you pick, you adjust the settings until it becomes transparent. The idea behind it being green is due to the fact that most skin has a magenta tint to it. Therefore green is the complimentary color and offers the most contrast. This will allow the chromakey effect to select only the green parts. As well, we also added photo lightboxes so that the green screen was well lit. This is important so that the creases and waves in the fabric don’t come across with a hard shadow. The more color variations in the green, the more you have to adjust the chromakey filter in the software. That was it! Here is a final quick look around on video!